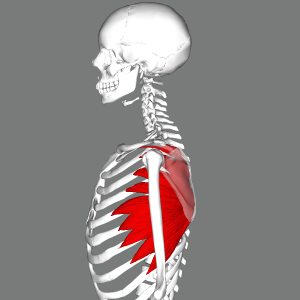 The serratus anterior is often a focus for shoulder pain treatment. One of the most common areas where we receive requests is in shoulder pain treatment. In order to get the most out of any related procedures, it is important to understand some aspects of the shoulder’s function. The ability of the shoulder to stabilize is not independent of its mobility, but rather its ability to find its location in space. One of those muscles most overlooked is the serratus anterior. This muscle has a scapular control function that has major implications in shoulder pain. We find that tight and inhibited muscles – perhaps the subclavius and the pectoralis minor – is an unfortunate result of this muscle’s ability to control the scapular function. We have found that rehabilitating the shoulder should progress with the serratus anterior as a starting point for evaluation as well as the ending point of the stability. This is only one of the muscles which we find to be a major contributor to shoulder pain. In fact, there are several other muscles which we find to be areas of focus in shoulder pain treatment. As with most physical ailments, you don’t have to be an athlete to experience pain in this area. Road warriors often need help. Think about the way you carry your luggage or laptop, for example. A surprising variety of physical activities at any average office or place of business can often cause shoulder pain as well. The best option of course is avoiding shoulder pain treatment altogether. Here are some insights from Dr. Hull on rehabilitation and prevention of shoulder pain. To find out how we can approach shoulder pain treatment for your body’s specific needs, reach out to us at Dynamic Spine and Sports Therapy.